The stage of the John de Silva Memorial Theatre was dressed to facilitate a drama of different aspect on January 8. The stage there was to allow a drama, Thei Yath Tha which was orchestrated to suit the alternately able children. 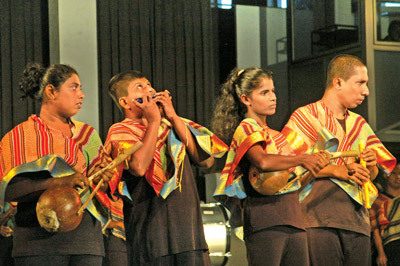 It was a play titled Thei Yath Tha directed by Professor Sunanda Mahendra in close collaboration with Ramani Damayanthi and Kala Suri Rohana Deva seemed to be marking a watershed in the Sri Lankan theatrical evaluation. The subject matter developed to a play was derived from a narrative poetic work by Bertolt Brecht. The protagonist of the drama is a prophet who is compelled to leave his country in the aftermath of not having any more guts to withstand several social defects such as Social corruption, wielding of power, the mis-deeds of the fellow citizen and the country's administration. Disappointment and despondency of the dysfunctional nature of the country cause the prophet tight lipped to his decision of leaving the motherland despite the request of the students not to leave. They don't want to lose their master who kindled the lamp of wisdom within them. Against all odds the prophet is adamant in the decision he has already made and leaves the country with somewhat reluctance. No sooner he steps into the territory where he is going seek asylum he meets a guard at the check point. The master and the pupils who came with him are questioned by him. The students tell him they have learnt more things on power. In return, the guard interrogates what have they came to know about power. Thus, the students explain the subject of power to him. Still an illiterate man the guard shows his potential and the likelihood of learning. The prophet the kind man teaches the guard and his wife the aspects of power, wealth, hatred, and kindness. Reading the comprehensive degree on the above mentioned subject areas the prophet brings out a book full of wisdom for all the things. Suddenly, it occurs to him he should go back. It is up to the spectator to deem that though the prophet comes out with knowledge, a separate man (the guard) is there instilled with wisdom whom to propagate his wisdom to the next generation that might be in quest of knowledge. Even though, the subject matter was borrowed from a poetic work by Bertolt Brecht the drama has been traced in accordance with the Sri Lankan social and religious back wash. When the prophet is about to leave the country the students implore him not to go. 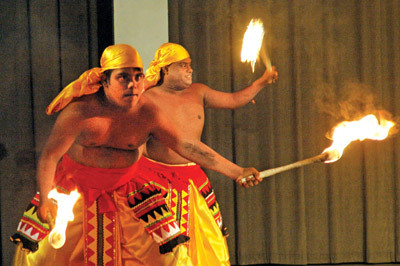 These requests are made in the three main languages of Sri Lanka- Sinhala, Tamil and English. Those are the fine gestures which delineate the Sri Lankans' patent within the drama. The advent of monks on to the stage widens the religious dimensions the group of director tries to unravel. The gestures of the cast are satisfactory. The prophet on his journey to the other land has to pass jungles dense with ferocious animals. To pierce the picture of horror and fierce of nature into the hearts of the spectator the play showcases ample importance over the animal behavior. Important is the dance of the lions. The animal gesticulations carry a heavy weight on the mindsets of the spectators. The alchemy of music, gestures and the singing along with the dances add the vigour and the luster to the creation, catering to the aesthetic thirst of the drama loving division of the society. 'The society is not a bed of roses, so that is what the simple message the drama tries to put across. The guru in the drama is not a selfless man as you think. Are you sure he is that much socio genic? So, why does he leave his country to take refuge in another land? Why cannot he contribute to a change of the society which is plagued by the misdeed and corruption? questioned one of my friends who happened to accompany me to the drama. But I didn't answer him on the spot where the drama was staged. The cluster of questions appears a food for thought. I thought it better to have a time to mull over it. What couldn't be voiced should be translated into the words. The moment I began to write this review has recommended me to answer the questions as the answers themselves would divulge the very political and social aspect of the drama. Bertolt Brecht in his creations injects some political and revolutionary ideas to the discretion of the reader. The playwright has not damaged what Bertolt Brecht subtly instigated into his poetic work. Marxism was the line of thought can be unearthed in each and every work begot from the thoughts of Bertolt Brecht. So Thi Yath Tha cannot be an exception against the ideologies of Brecht. The co-existence is meant through the ideologies. No nationalism is aroused. Like manner, the prophet dampens the mind and the heart of the guard with knowledge to stimulate the wisdom irrespective of his nationality as the prophet did to the children of his country. So he is a man of supremacy and generosity. The society is no good. No good is the people living in it. So the corruption and the megalomania cannot be mopped out on the world surface. The asymmetry prevails and the lack of possibility to result a parity amongst the individuals. The Marxism look down disparity, injustice of the society upon anticipating a society where the justice, equality and brotherhood crown though it is unlikely to gain ground. The guru on the drama respects those norms to happen. He teaches the student with the hope that such a world would dawn in the offing. I remember a writer of Daily News on December 23 last year in Artscope despised a pathetic attendance at a lecture on literature. The writer without being confined to the allegation presented the statistics witnessing the poor attendance of the University students. The situation seemed to be the same in case of Thei Yath tha. On the way to John de Silva I saw lengthy polling at film halls. No matter what dramas may not hold any meaning to them. But the little lot of genuine lovers of Sri Lankan theatre congregated to John de Silva and fancied a drama of excellence.